Unlike the somewhat basic affair that is the Tamron AF 70-300mm Macro, the new Tamron SP 70-300mm f/4-5.6 Di VC USD has all the latest bells and whistles, or at least their high-tech, optical equivalents. Proudly sporting Tamron's Super Performance (SP) badge, the lens is available in Canon, Nikon and Sony fit options, although Vibration Correction is omitted on the Sony version, due to these cameras having built-in sensor-shift stabilisation. We'd have preferred VC to be included on the Sony version, to give a choice of stabilisation methods, as with the Sigma 70-300mm f/4-5.6 DG OS. Unlike Tamron Di II lenses, which are specifically designed for APS-C cameras, this Digitally Integrated (Di) lens is full-frame compatible, although will usually find its home on an APS-C camera. 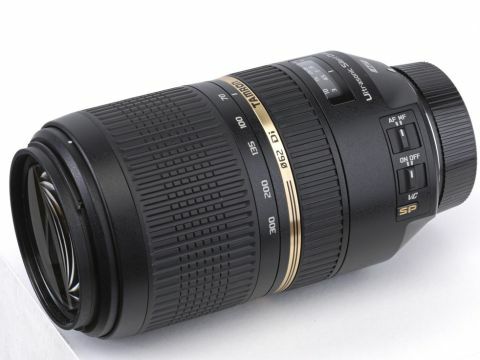 For Nikon and Sony camera users, the effective zoom range will be 105-450mm, and 112-480mm on a Canon body. Based on 17 elements in 12 groups, the Tamron SP 70-300mm f/4-5.6 Di VC USD features both a Low Dispersion (LD) and Extra Low Dispersion (XLD) element to boost image quality and reduce chromatic aberrations, also known as colour fringing. Advanced features include ring-type ultrasonic autofocus. Like the similar system fitted in the Nikon Nikkor AF-S VR 70-300mm f/4.5-5.6G IF-ED, it's fast, ultra-quiet and comes complete with full-time manual override in single or 'one-shot' autofocus mode. Because the focus ring doesn't rotate during autofocus, Tamron has positioned it at the rear of the lens within easy reach, and there's a good focus distance scale positioned beneath a viewing window. The internal focusing mechanism also means that the front element neither extends nor rotates throughout the focus range, which is a bonus when using rotation-specific filters such as a circular polariser or graduated neutral density filter. The other standout feature is Tamron's Vibration Correction (VC) system - an optical stabiliser that offers 4-stop performance in fending off camera-shake.